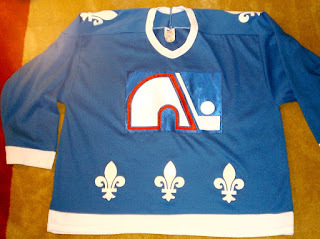 Keeping on the Nordiques theme from last post there is a Nordiques jersey that I "made". This jersey originally had some screen printing across the front chest. I covered that with a square blue piece of tackle twill. 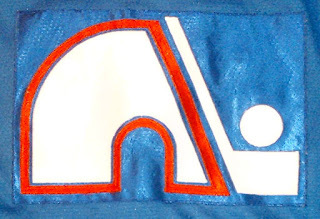 Found an old Nordiques logo on the internet and made a crest for the front of the jersey out of various coloured twill. It's supposed to look similar to the Nordiques jersey worn in the later half of the WHA and their first year in the NHL. After seeing pictures of actual game worn jerseys I can see the proportions in the logo are a bit off the game worn one, but what's done is done and it was good enough for me. There is a #3 on the back. The blue rectangle that I had sewn on blend in better than the photo shows. The flash of the camera makes it look like their is a bigger colour contrast than there actual is. No longer have this jersey. 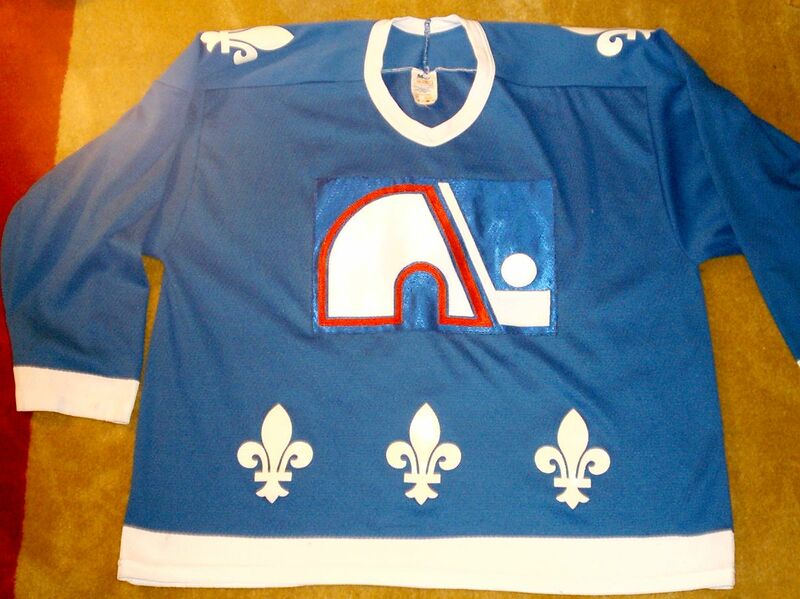 Gave it to a friend who frequently gives me rides to hockey a while after I got the 00 Nordiques jersey. In charge of and play scrub (aka pickup) hockey a couple times a week, occasionally do DIY hockey jerseys and other crafts, and am a thrift store junkie.